Sami Haddadin is a professor at the Leibniz Universität Hannover and Director of its Institute of Automatic Control. His company Kastanienbaum is a spin-off from the Robotics and Mechatronics Center (RMC) at the German Aerospace Center (DLR), which was funded by Helmholtz Enterprise. Mr Haddadin, can robots and humans work together? They already do so in some fields, however, not in a manner one would wish for. This collaboration could reach a new level: I want humans and robots to act and work together, in short, to co-exist. To enable this, we work on rendering a robot's capabilities more similar to those of humans. A very central aspect here is tactile capability, the delicacy of tactile perception. 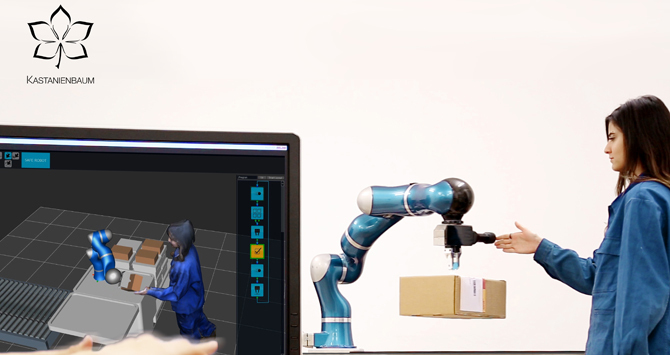 Such a sense of touch is important for many processes where humans and robots potentially come into contact, for example, for tricks such as robots playing ball, yet also for robots that are intended for complicated assembly work. Such a tactile sense is relevant both for the fields of science and industry. What makes the collaboration between humans and machines so difficult? If one wants robots and humans to work together, hand-in-hand, as it were, then two major problems need to be overcome. The first is the problem of proximity: for their own safety, humans usually have to keep a distance to the machine. Robots are already being used in many fields of industrial production where humans cannot work, since the risk of injury is too great – and that is due to the lack of tactile sensitivity, amongst other things. As a result, robots are so far always surrounded by wide safety areas and corresponding barriers. That is expensive and prevents efficient collaboration. The second major problem is the fact that the technology is largely incomprehensible for non-experts. So far, robots are usually just as complicated for humans as a cockpit is for someone who has no idea about flying. For instance, the assembly robots at automotive manufacturers still require elaborate programming. We want to address these two major problems or, rather, we have already overcome them. What are the solutions provided by your company "Kastanienbaum"? We have already managed to tackle the problem of safety very well. Instead of planning a large safety area to separate humans and robots, we try to teach the robot what safety really means. The robot is to learn that humans are fragile and can be injured. For this, we have developed an algorithm to enable the robot to learn just that. This brings humans and robots much closer together and this is where our second innovation applies. We want to render robots more comprehensible for humans, make them a commodity technology for everybody. Our technology makes the robot more intelligent and so it is easier for humans to operate it. One may think of it like this: instead of telling the robot how it is supposed to do something, we design tools that allow us to tell it what it is supposed to do. This way, humans can program a robot all by themselves. Instead of a complicated cockpit, a robot should be as easy to use as a car or smartphone. These, too, are highly complex technologies, yet they have been made operable for everyone. Where could the smart, safe robots be used? Our first thought here is, of course, the industry, in particular the production and assembly processes where robots already are being employed. They could take over far more work in this field. This also includes tasks that these days only low wage countries can perform in an economically reasonable manner and which nobody in our country is prepared to do any more. The monotonous assembly of entertainment electronics devices falls under this category, to name an example. With the aid of work stations where humans and robots can safely work together, these jobs could in future once again be performed in the same location where development takes place and where the market is. This would result in higher quality by way of more process reliability and at the same time save resources due to shortened transport distances. Moreover, anybody observing the demographic change in Germany can see for themselves that in future we will not be able to do without robots in order to maintain our economy's high degree of productivity. Yet we want to use robots also in other fields where they could be equally useful. For example, we want to make them usable and affordable also for small and medium-sized enterprises. Robots could be used also in logistics. And there are many more fields of application, from the health sector to service robotics. After all, all these developments start with the same considerations: how can robots be made more similar to humans in a meaningful manner and, at the same time, safer and easier to operate? Basically, I am a realistic person. But I also firmly believe that the time of promises now really is over; the coexistence of humans and robots is only a matter of time, not of technology any more. The technology is available now. And that will push robots out of their niche existence for experts only and make them available for everybody. Given this premise, one can almost only guess at what immense potential awaits us in the combination of robotics and the digital world.